where use has been made of Equation (11.44). Here, is determined implicitly in terms of the ship speed via expression (11.58). 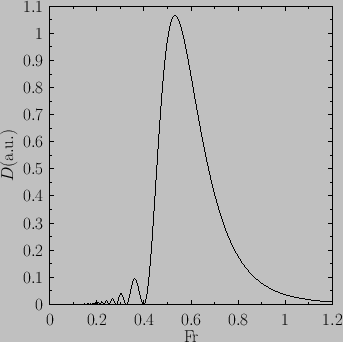 Note that this expression cannot be satisfied when the speed exceeds the critical value , because gravity waves cannot propagate at speeds in excess of this value. In this situation, no transverse wave train can keep up with the ship, and the drag associated with such waves consequently disappears. In fact, we can see, from the previous formulae, that when then , and so . However, the transverse wave amplitude, , generally increases significantly as the ship speed approaches the critical value. Hence, the drag due to transverse waves actually peaks strongly at speeds just below the critical speed, before effectively falling to zero as this speed is exceeded. Consequently, it usually requires a great deal of propulsion power to force a ship to travel at speeds faster than . Figure 11.2: Variation of wave drag with Froude number for a ship traveling through deep water. This characteristic speed is sometimes called the hull speed. It can be seen that the hull speed increases with the length of the ship. In other words, long ships tend to have higher hull speeds than short ones.